Adult Size: Size is typically between 6 and 10 inches in Maine. 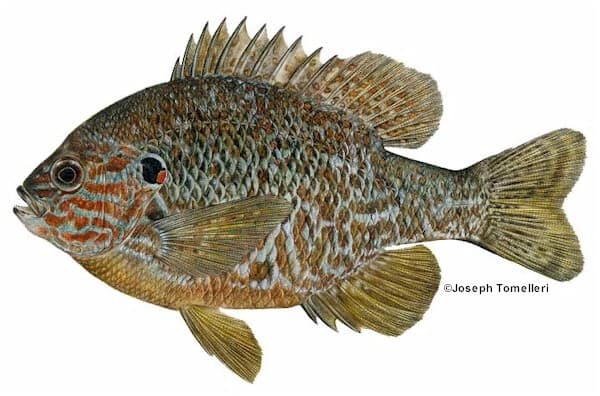 Identification: The pumpkinseed is a very deep-bodied fish, almost disclike, with several spines in the dorsal fin. The lateral view varies from golden brown to olive on top to irregular, wavy, interconnecting blue-green lines in the middle, to bronze or red-orange on the ventral surface. The side of head and body have blue, emerald, or green reflections. The opercle, or gill-cover, is mostly black with a trailing tip that is black and rimmed with a small halfmoon of bright red.